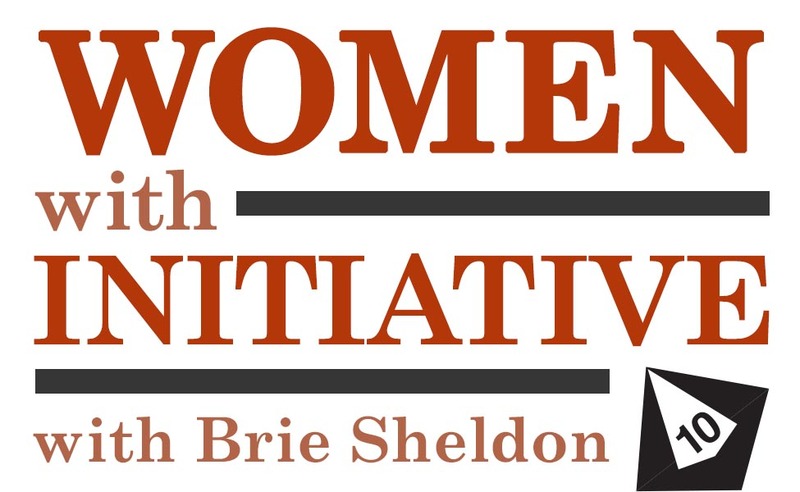 Today's Women with Initiative feature is with J Li! J is a designer primarily in larp, and her recent work has been really fascinating! Her work on emotional immersion in larp has been a significant focus, specifically looking at formats and design elements that capture the experience of Chinese action/fantasy films and anime where there is intense emotional, situation-reaction content. 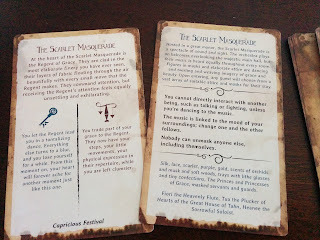 Many of her games are parlor style larps, and her current projects Mermaid and Keymaster use structure and design to encourage specific behavior and emotional involvement. She also has some really cool work on Pattern Language for Larp Design. I asked J a few questions and her responses are below! What inspired you to start working on Larp Pattern Language and what uses do you think it will have? I've always broken down my games in design patterns. For many years, when people would ask me for design advice, I would rattle off numbers and shapes-- make sure this person has that many subplots, arrange your room this way, this thing won't work unless you add more complexity to balance, etc. I think it just came from writing and running a ton of games (I got started making secrets & powers games at Stanford, and there were a lot of them), just common trends that came up. I could visualize it all in my head. A few years ago, I realized that most people don't necessarily visualize things the same way, and also that if I wrote about them it might be useful shortcuts for other people. I knew that Jason Morningstar had a similar design philosophy, so I approached him about giving a panel on it. Once we started planning, it became pretty clear that there's actually a lot of content there. Since then, we've gotten a lot of requests to expand it to tabletop-- which actually makes a lot of sense, because it's really just about human-to-human live interaction design. If you look at visual design, it's a very advanced field with a lot of key patterns that people use all the time, like grid layout, color theory, typographic principles, etc. And of course architecture is where it started. My dream is, as larp becomes rapidly more mainstream, for the patterns that we're surfacing now to form the groundwork of fundamental design theory for live human narrative/creative/social interaction. Someday, live interaction design 101 can cover topics like group size and player energy management, that would be awesome. Your collection of parlor larps is stunning! Where do you find ideas for larps and how have you developed the concepts? The desire to make high-stakes decisions or pass judgments. The desire to be beautiful or hideous. The desire to let go of responsiblity, to be destroyed, to be in the spotlight, to hide, to give up, to try something ludicrous... I pick one that seems to be scarce lately, and make a game about getting to experience that. Keymaster is about raw desire to be important and dramatic. Mermaid is about making moments of harsh passion while not having many options. Argentin is about getting to interpret your own identity without having a future. 3. I add an atmosphere that I would love to write or play in, like the ruins of a historical desert empire (Fires of Emsi) or the nature/civilization tension between a raw ocean, the people who survive beside it, and decadent inlanders (Mermaid). What are your favorite parts of developing larps and examining their elements? I love the patterns, and I love the part that's just directly creating beauty-- making the atmosphere happen and wrapping it in a unique way around each character. Giving the character a "taste". And also setting a balance between that and making the character inhabitable by player interpretation. Thanks so much to J Li for the interview! I hope you all enjoyed reading this and like checking out J's work. Hi all! I have an interview today with David Schirduan about his games Mythic Mortals and Maroon Corps! He had some cool stuff to say about his projects, so check it out! Tell me about your project. What excites you about it? I've got two big projects right now, one is just wrapping up, and the other is just beginning. Mythic Mortals was my first "real" project. Kickstarted last year, I just released the third expansion, which finishes off the content promised in the Kickstarter. In Mythic Mortals, you play as yourself suddenly granted incredible powers. The game uses cards and dice to provide quick, action-packed fights. I designed Mythic Mortals from the ground up to be perfect for one-shots and pick-up games. The thing that excites me most is how easily new players jump into the game. I play almost exclusively with new players, and Mythic Mortals was a unique opportunity to tailor a game specifically for those people. Playing as yourself in your hometown makes it easy to jump into a game. Combat is easy to understand, and easy to engage with. The card mechanics FEEL good. They are very tactile and approachable, so much so that playing online is difficult, and required a bunch of special roll20 guides and assets. I'm excited to see more games explore the design space for one-shots and introductory gaming. As for my other project, Maroon Corps began as a sci-fi themed dungeon crawler; my attempt to understand the OSR movement (which is still mystifying to me). Over time it morphed into a board/card game, and then back into an rpg. Maroon Corps replaced skill rolls and resolution mechanics with a resource management, push-your-luck system. Dice are used to track resources, and are rarely rolled at all. There is some randomness, but most of the fun comes from exploration of "What's in the next room?" rather than "Can I avoid the trap?". Major inspirations are Into the Odd, One Deck Dungeon, and Paranoia. While still allowing for story-telling and GM-centered world flexibility. With Mythic Mortals, you created the game to make it easier to accommodate new players and have short sessions. What did you consider with the design to ensure these things worked? Simple Rules, Complex Classes. The core rules of Mythic Mortals are boringly simple, and can be explained in about 2 minutes. The complexity and the fun comes from the classes. Player's only need to know about their own 16 abilities, only 4 of which are active at any given time. They don't need to know about any other rules, or any of the enemy rules. As it turns out, it takes most players about an hour to figure out and grow comfortable with their class, and another hour or two to master their class completely. This is the sweet spot, and by the end of a session, players have fully explored and enjoyed their class. No Advancement Requirements. Everything is available from the start, albeit with a little luck required. I always hated starting a new game and seeing a really cool level 20 ability that I know I'll never get to use. Instead, Mythic Mortals uses shifting abilities/weapons/bonuses to provide variety, rather than locking content behind leveling walls. Familiar Setting/Tone. Playing as yourself defending your hometown from monsters makes it very easy to jump into a game. Players can fight at their favorite restaurant, or school. The GM doesn't need to explain the epic backstory behind this brand new town; everyone already knows the location and the culture. Tactile and Tactical. The cards and the dice are fun to use, and feel really good to manipulate. No pencils or complex math needed! Some players are intimidated by character sheets full of numbers and text boxes, but everyone is familiar with cards and dice. It looks more like a board game, and feels like a card game. Combat is easy and fun. I don't know about you, but in my first few role-playing games, I clung to combat like a drowned rat. Role-playing, funny accents, dramatic dialogue, or clever planning were alien to me at first. But combat had very clear rules and created constraints for me to work around. "How do you kill it" is easier to engage with than, "What do you say to the king?". Combat is a great place for new players to engage with the game. Simple to GM. The GM doesn't have a lot of work to do; enemies are simple, and plots are even simpler. The game includes a handful of adventures, and making your own scenarios is extremely simple. This means Mythic Mortals can be run off the cuff by a GM who just finished the core book. Mythic Mortals is the kind of game I wanted to play when I started exploring rpgs. It won't replace huge, multi-session games like DnD, Burning Wheel, or Numenera; but you'll never find a better game for new players or one-shots. Since sometimes dungeon crawls can get repetitive, how do you keep people engaged when playing Maroon Corps? Death is Celebrated. A lot of Dungeon Crawlers try to create a tense, dangerous atmosphere where only clever planning and luck will save you. By contrast, Maroon Corps creates a funhouse of sawblades, spiky monsters, and dump traps. Players have 5 backup clones to replace their character when they die. Not only does this minimize death as punishment, but we encourage it by using Lockers. Lockers. When a new clone is revived, they are randomly assigned a locker filled with goodies. Each locker could contain special weapons, one-use items, or strange little oddities. Whenever a trooper dies, it's like opening a present on Christmas morning. This also means that dungeons don't need to contain much loot, since most characters will get several lockers worth of goodies. Quirks. A recent addition to the rules, new clones are also assigned a random Quirk which will change how they play the game. Some quirks are mechanical, some are more role-playing focused, but they are all funny and absurd., some are harmful, but most of them are weird or absurd. My favorite quirk so far is: "Clumsy - You cannot use your hands to manipulate your dice. No one may help you." Maroon Corps is fast. The mechanics are stripped down and streamlined to provide an almost board-game like experience. Players can move through rooms very quickly, stopping where they want, and speeding through the things that don't interest them. Players are never bogged down by checking or traps at each room, or slowly touching everything with a 10-ft pole. Maroon corps provides danger and death, like all good dungeon crawls. But Death is an exciting event, rather than something to be dreaded and avoided. Mythic Mortals has some interesting card mechanics. Can you talk about how they work and why you put them in place? I've always been a "Mechanics First" kind of designer. Mythic Mortals start out as a small project with one goal: design a role-playing game where your cards are your stats. My original game had about 8 different card slot players needed to fill. With a setup like that, players don't make decisions; they just keep drawing and placing cards, keeping the best ones, and getting rid of the worst. It wasn't until I came up with the idea of cards constantly shifting that the game really came together. I think this is the primary appeal of Mythic Mortals. Every few turns, players get to completely re-build their characters, allowing them to adapt to new situations. It also means that every few turns players get to try out new powers, weapons, or character flaws. Each card presents a tough decision. Mythos: Roll under this slot to use your special abilities. Accuracy: Roll under this slot to use your weapon. Defense: Roll under this slot to dodge attacks. Damage: This is how much damage your attacks deal. You draw a 10 of Hearts, and a 3 of Spades. Normally, you would put the 10 in the slot, simple as that. But the weapon unlocked with Hearts is not very helpful to you right now. The spades weapon, however, is VERY useful. Which one should you put in that slot? It is choices like these that keep Mythic Mortals interesting, forcing you to make tough decisions every few turns. Could you talk about how you track resources with dice in Maroon Corps? In combat, you can fire your Blaster at an enemy. It deals damage equal to its current charges, and then loses one charge. For example: Your blaster has 4 charges. You fire, dealing 4 damage. Your blaster now has 3 charges. When you take damage, your suit charges are reduced, one for one. For example: You have 5 suit charges. You take 3 damage. You have 2 suit charges remaining. You can also spend suit charges to overcome obstacles: open doors, translate information, detect lifeforms, etc. When either your suit or your blaster charges get low, you can try charging up. I won't go into the full rules, but the higher your blaster charges, the more dangerous it is to try and re-charge your suit. Not only does this mean you can accidentally die while trying to charge up, but it also encourages you to shoot as many things as possible. One of the core themes of the game is that the dice are rarely, if ever, rolled. There is still a little bit of luck and randomness, but the emphasis is on resource management rather than random die rolls. Any tension comes from the mystery of "what's in the next room" rather than, "Can I roll above a 7?" Players almost never feel cheated by the dice in Maroon Corps. When can we expect to see more on Maroon Corps? I have no idea. After running the Kickstarter, I've become all too wary of how much pressure sits on a game with an announcement date :) So for now, Maroon Corps is in a casual beta. If anyone wants to peek at the rules, just shoot me an email. I'd be glad to hear some feedback and get some playtesting in. Thanks so much to David for the interview! I'm looking forward to seeing more about Maroon Corps and I hope everyone enjoys checking out Mythic Mortals! 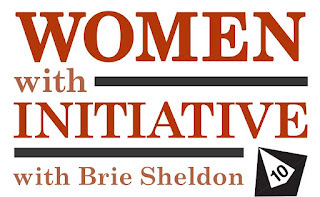 Today I have an interview with Christian Griffen on Meridian! Meridian is hitting Kickstarter and I'm excited to see how it goes. I'll let Christian tell you about Meridian in the answers below, and you can check out an actual play as well! Tell me a little about Meridian. What excites you about it? Ever since I was little and The Neverending Story came into my life, I've been daydreaming of journeys to amazing worlds of the imagination. Occasionally works like Labyrinth or Mirrormask tapped into that same vein and reminded me of how profoundly touching these stories are to me. I've always wanted to have that kind of experience with a roleplaying game, but the Hero's Journey that we get from most adventure RPGs are quite a different thing. It's only now, after 26 years of playing and 11 years of designing and publishing RPGs that I've developed the techniques to bring this dream to life. What excites me about Meridian is that it provides evocative places, characters, and moments for anyone to go on a fantastical journey, while leaving enough to the group's imagination to make each experience unique. Of course it's not exactly the same journey as Atreyu's in Fantasia or Alice's in Wonderland, because Meridian is its own place and follows its own laws. It's my unique addition to the wondrous journey genre, and the games I've played with others have been nothing short of magical. What are the most important elements of the wondrous journey genre that you wanted to bring forth in Meridian? There is a special sense of fantastical exploration in these stories. Usually the worlds have a dreamlike quality and provide a wonderful canvas for the imagination. We get to experience wonder together with the protagonist, like when Sarah meets a talking fox riding on a sheepdog, or when Alice grows and shrinks because of the foods she ingests in Wonderland. Though these worlds are dreamlike, they follow their own internal rules. This is true for Meridian as well: every Locale that you visit has three laws, which are generally unbreakable. They also invite imaginative play. For example, in the Midnight Conservatory, anything that's planted in the soil sprouts and grows into some sort of flower or tree. Players have a lot of playful exploration with this as they figure out what would grow from the various things that the Journeyer has on hand. And most of the time, they'll find that their subconscious will come up with things that fit, thematically, with the kind of journey they're on. What kind of mechanics do you use in Meridian to resolve conflicts and involve story elements? These journeys are not about conflicts, which sets Meridian apart from most other RPGs. Instead, the mechanics in Meridian focus on changing those who travel through it. Each Journeyer also has an important final decision at the end that's influenced by the choices made along the way. Providing story elements is where Meridian really shines. Each Locale has a list of sensory impressions, details, and characters with titles like Helea of the Abandoned Heart or Morok the Shadowmonger. 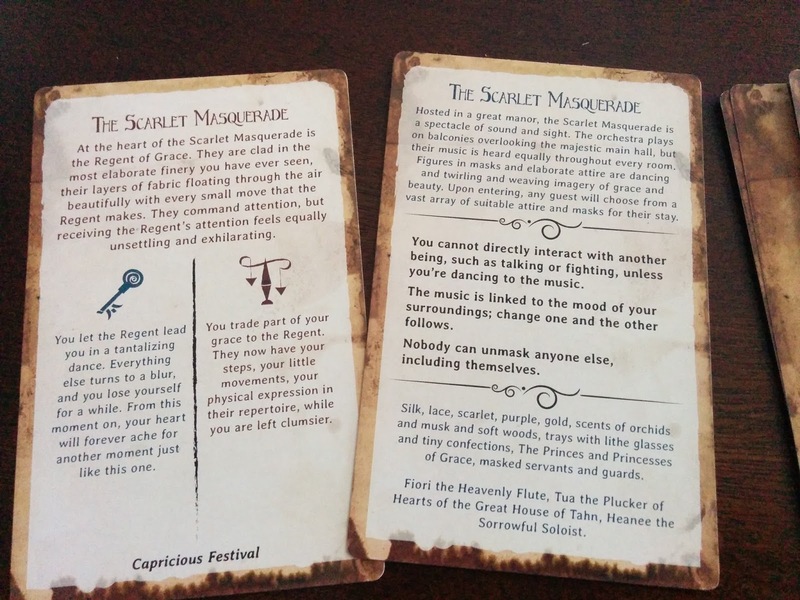 The players use these in conjunction with Cadence cards, which are short, evocative statements such as "a tiny creature, mumbling, eagerly gathering for its collection" or "gauzy walls of gossamer with shadows moving on the other side." By adding their own dash of imagination, players have a lot of fodder for truly unique characters and moments. How do you define the different roles in the game - the Journeyer, Guide, Touches, and Companions? One player controls the Journeyer who explores Locales, interacts with other characters, and goes through changes and choices. Another player, the Guide, is in charge of the Locales and of transitioning the Journeyer among them. The other players start as Touches, who introduce additional characters that interact with the Journeyer. These characters usually remain at their Locales, but a Touch can claim one of them and become a Companion, who will then travel alongside the Journeyer for the rest of the game. There are several kinds of Companions with different roles and options, ranging from a possible romantic connection to a dark aspect of the character's personality stalking them through Meridian. 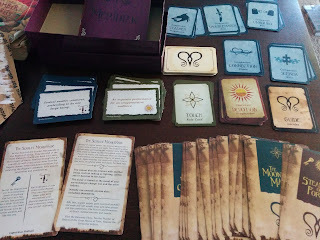 Role cards for each player lay out their part in the game and any special rules that apply to them, so players don't need to pass around the rulebook. It's a very important design principle for me that players can just focus on their shared imagined journey through Meridian and don't need much out-of-character talk once they begin. If you were able to tell a story through Meridian that really captured the essence of the game, what would happen to the Journeyer, and what would you want to have players carry forward? This is a tough one, because a major part of the design is that every journey is different. I've played several journeys through Meridian, both with close friends and with new people at conventions, that have really touched me. In one of them, a Journeyer came to Meridian because, after losing his wife to cancer, he was searching for a way to give his heart away so that he would no longer feel the pain. He thought he would never get better, that his own life was at an end. As he journeyed through Meridian, he gathered a couple of Companions around him. One was a singer of mournful hymns he met at the Mausoleum of Mirrors. At one of the Locales, she used her progression to sacrifice her own heart to help the Journeyer with his pursuit. They finally arrived at the Midnight Conservatory, where the Journeyer shared the Mournful Gardener's sorrow and asked him why he was so sad, surrounded by all those beautiful plants. As their tears watered the ground, he realized: "Without sadness there can be no growth." So the Journeyer planted his own heart in the soil, and in accordance with the Midnight Conservatory's laws, a new plant sprung up with fresh hearts growing on it. He took one for himself and gave one to his Companion. He realized now that he had to feel the pain in order to grow, to really live. At the end of that journey, we had tears in our eyes. And we carried something forward from that, something I will always remember as if I'd lived through it myself. I would love for players to carry their own such insights forward from each of their journeys. But even when a theme didn't emerge so strongly, we always had moments of beauty, of quirky wonder, of strange but fantastical interactions. And those are always worth the trip. Thanks so much to Christian for answering my questions! 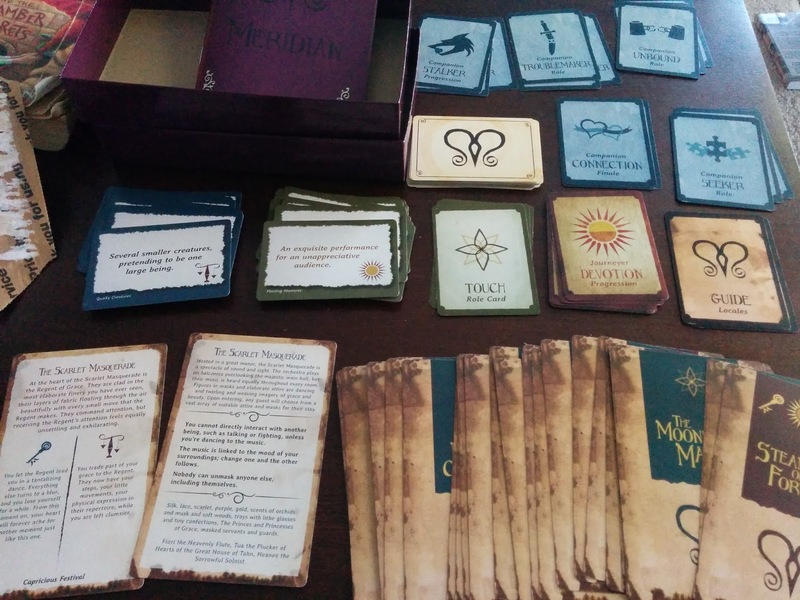 You can check out Meridian on Kickstarter, and see more on Berengad Games' website.